Spring is finally popping up all over. Fruit trees are budding and the forsythia is a bright and cheerful yellow! 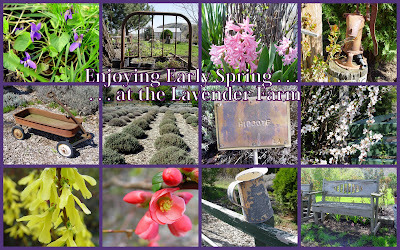 The lavender farm is coming to life as well, although slowly. It will be the first of June before purple blossoms grace the gray-green of the foliage upon which they grow. The gentle green of grass and trees, along with flowers tucked along the garden paths, create a quaint and serene place for walking and relaxing. . .even without the full fragrance of lavender bud. A river flows by swiftly nearby, creating tranquil sounds naturally, without the use of a white-noise machine! A perfect place to sit and dream on a sunny day. A little bit of heaven on earth. Happy Spring! Double click for larger view of photo. Such a pretty and welcoming spot. Your mosaic is great with my favorite three being the pump,the gate, and the bench. Now that was hard because those blossoms are gorgeous. oh...yes..it is Spring...we have sunshine coming...everything is blooming...I love this change....and now I have a huge deck...and so enjoying being able to be outdoors more.....I am thankful for our seasons..
First time to your blog, it is beautiful. Your picture mosaics are gorgeous. Lovely mosaic, the pictures are beautiful.